Reading is known for its medieval abbey ruins, the beautiful Thames Valley countryside and its picturesque river trips up the Thames and Kennet. If you’re looking for hotels in Reading, we have the Mercure George Hotel Reading, located right in the heart of the city. The 3-star hotel is an attraction in itself – it’s believed to be the oldest existing building in Reading and dates back to at least 1423. 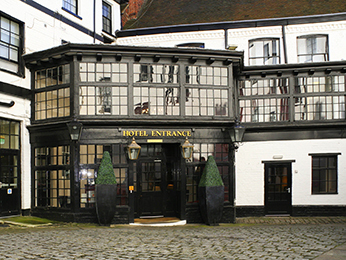 Once a popular coaching inn, the Mercure has managed to retain its original charm with Tudor archways and a cobble stone courtyard. The 76 rooms have been wonderfully restored with a traditional design, and feature all the modern day amenities such as free Wi-Fi, digital flat screen TVs and en-suite bathrooms. Enjoy the signature Mercure welcome with personalized check-in as well as 24-hour room service. From the hotel, you’ll be well placed in the city centre. Walk to Reading Museum to see the remains of the Reading Abbey, founded in 1121 by King Henry I. You can still see some of the beautiful Romanesque stones, cloister capitals and other decorated stonework in the Museum’s gallery, as well as a 12th century tomb chest from Henry I and his wife. After you’ve visited the Museum, walk around the neighbouring Forbury Gardens, a large public park where you can enjoy a picnic lunch. Fans of Downton Abbey won’t want to miss Basildon Park, a stunning 18th century Georgian mansion that was used as the Crawley family’s London home, Grantham House.